It is a common request that fathers want to say a few words at their daughter’s wedding. And dads are always asking us what they should say. 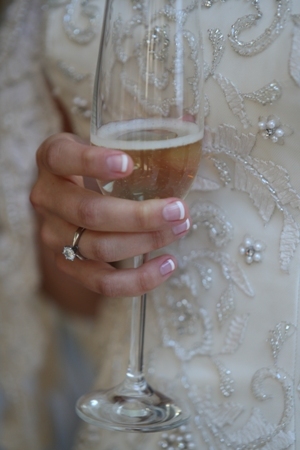 After witnessing many-a-toast, here are a few of our guidelines. Do not feel you have to include them all. 1) Welcome your guests, and thank long distance family and friends for traveling. 2) Tell a favorite little story about your daughter at a young age. 3) Mention proud achievements and fulfilled dreams, culminating into the woman your daughter has become. 3) Welcome groom into the family, i.e. "did not lose a daughter, but gained a son" sort of thing. 4) Give the groom some tips/notes (in a humorous way). 5) Mention the joining of two families. 6) Express the hopes and expectations, you have for your daughter’s future in marriage. 9) Remember this is a wedding, not a “roast”. DO NOT tell long drawn out embarrassing and comedic stories filled with jokes, insults and criticism. This is more appropriate for the rehearsal dinner. 7) Most importantly, keep your speech short - preferably 5-8 minutes max. Guests tend to get antsy and bored with long toasts.